Killdeer: Large banded plover, brown upperparts and white underparts, two distinct black bands cross upper breast. White stripes on wings are visible in flight. Tail and rump show rust-brown in flight. Black bill, pink-brown legs and feet. Wavering, erratic flight, capable of swift, direct flight. 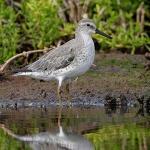 Least Sandpiper: Small sandpiper, brown-scaled upperparts, rust-brown crown. Breast, throat are dark-spotted; belly, undertail are white. Wings have thin, white stripes visible in flight. Black line on rump extends onto tail. Legs and feet are yellow-green. Swift direct flight with rapid wing beats. Lesser Sand-Plover: Medium-sized, chunky plover with gray upperparts, white underparts, and bright rust-brown breast band and nape. The head has gray-brown cap and thick black eyestripe broken by a white forehead. Throat is white with a black border. Bill is black and legs and feet are yellow-green. Lesser Yellowlegs: Large sandpiper with gray and black mottled upperparts, white underparts and streaked upper breast and sides. Bill is straight and uniformly dark gray. White lower rump and dark-barred tail are visible in flight. Legs are long and yellow. Swift direct flight with rapid wing beats. Little Curlew: Medium curlew, brown-streaked upperparts, white throat, dark-streaked gray breast, and white belly. Head has brown crown. Bill is short and slightly down-curved. Legs and feet are blue-gray. Forages in grassy fields. Bouyant direct flight with steady, rapid wing beats. Little Stint: Medium sandpiper, scaled-brown upperparts, white underparts. Face, neck, breast are rust-brown with black spots. The back has white lines that form a V pattern in flight. Black bill, legs, feet. Feeds by pecking at surface and probing mud with bill. Direct flight with rapid wing beats. Long-billed Dowitcher: Large, stocky sandpiper with dark, mottled upperparts, dark cap and eyestripe, short white eyebrow, and red-brown underparts with lightly barred flanks. Bill is long, dark, and dagger like. Legs and feet are yellow-green. Swift direct flight, rapid wing beats. 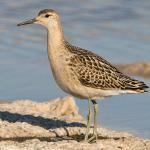 Marbled Godwit: Large sandpiper with black-marked, dark brown upperparts, lightly barred, chestnut-brown underparts. Long pink bill has black tip, is slightly upcurved. Pale brown underwings visible in flight. Feeds on crustaceans, mollusks, worms, insects, seeds, berries. Swift and direct flight. Pacific Golden-Plover: Medium plover, yellow-spotted, dark brown back, black face, and black underparts with white-mottled flanks; a white S-shaped mark extends from above the eye to along sides. Bill is black, thin, and short. Black legs, feet. Swift direct flight with rapid, steady wing beats. Red Knot: Medium-sized sandpiper with black, brown and gray scaled upperparts, red-brown face, neck, breast and sides, and white lower belly. Wings show white bars in flight. Bill is black and slightly curved. Eats insects, larvae, mollusks and crabs. Swift direct flight with rapid wing beats. Red Phalarope: Medium-sized sandpiper with dark gray upperparts and rufous neck and underparts. Head has white face, black cap, and a thick, straight, yellow bill with black tip. Feeds on small fish, insects and aquatic invertebrates. Flight is swift and direct with rapid wing beats. Red-necked Phalarope: Medium sandpiper with brown-striped dark gray back, mottled gray breast, and white throat and belly. Head, nape, and flanks are gray. Neck and upper breast are rust-brown. Bill is thin and black. Flight is swift and swallowlike with rapid wing beats, quick movements, and turns. Red-necked Stint: Small sandpiper with mottled brown upperparts and streaked cap. Underparts are white; upper breast is rust-brown and spotted. Face and throat are unstreaked rust-brown. Bill, legs and feet are black. Forages on shore, sometimes probes mud. Swift direct flight with rapid wing beats. Ruddy Turnstone: Medium sandpiper, red-brown upperparts, white rump and underparts. Face and breast are black-marked. Bill is short, dark, and slightly upturned. Wings have a unique brown, black, and white pattern visible in flight. Tail is white with black terminal band. Legs and feet are orange. Ruff: Large sandpiper with variably-colored frilly tufts on the neck that ranges from black to rufous to white to speckled and bared. Female lacks ruff. Head is orange-brown and the belly is white. Bill is orange with dark, drooped tip. Orange-yellow legs. Low, direct flight with rapid wing beats. 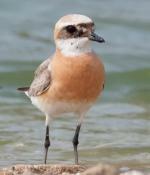 Semipalmated Plover: Small plover, gray-brown upperparts and white underparts. Forehead and faint stripe sometimes seen over eye, while face and collar are black. Bill is orange with black tip. Wings have white stripes visible in flight. Tail is brown with white edges. Orange legs, feet. Strong direct flight. Semipalmated Sandpiper: Small sandpiper with scaled gray-brown upperparts, white underparts, and fine streaks on the breast and sides. The black bill is short, stout and straight. Feeds on insects, worms, small mollusks and crustaceans. Legs and feet are black. Swift flight on rapidly beating wings.